Located in Gracechurch Street in the City of London, this church was first recorded in the late 12th century (although there had apparently been a church here for some time earlier) and was named for St Benedict of Nursia, the founder of Western monasticism (St Benet is apparently a short form of that name). The church, which stood on the intersection with Fenchurch Street and is among a number of London churches dedicated to that particular saint, is sometimes called St Benet Grass Church – that name apparently relates to a nearby haymarket (see our earlier post on Gracechurch Street). Records apparently show that during the reign of the Catholic Queen Mary I, Biblical texts which had been added to the interior walls during the earlier reign of her brother, the Protestant King Edward VI, were removed. The church was repaired in the early 17th century but subsequently destroyed in the Great Fire of London. It was among 51 churches rebuilt in the aftermath to the designs of the office of Sir Christopher Wren. It continued on until 1864 when the parish was united with All Hallows, Lombard Street, which was later among a number of churches united with St Edmund the King and Martyr in Lombard Street. The church building – its spire had come in for some criticism – was demolished just a couple of years later in 1867-68 (its removal helped to widen Fenchurch Street) and the site apparently sold for £24,000. 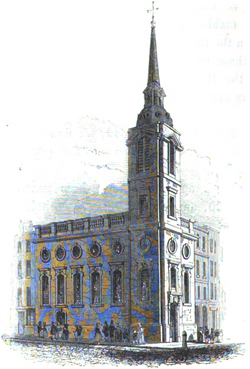 The pulpit is now in St Olave, Hart Street, and the plate was split between St Benet in Mile End Road – which was built with the proceeds of the sale of the church land – and St Paul’s Shadwell. (St Benet Gracechurch was apparently only one of two of Wren’s churches never to have an organ). There’s a plaque marking the location of the church at 60 Gracechurch Street. The narrow street St Benet’s Place also references the former church. PICTURE: St Benet Gracechurch in the 1820s from The Churches of London by George Godwin (1839)/Via Wikipedia.